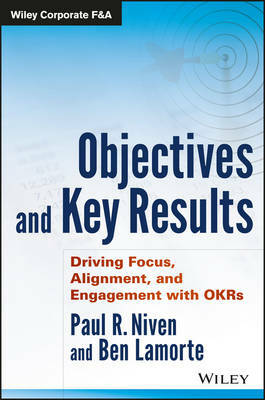 Everything you need to implement Objectives and Key Results (OKRs) effectively Objectives and Key Results is the first full-fledged reference guide on Objectives and Key Results, a critical thinking framework designed to help organizations create value through focus, alignment, and better communication. Written by two leading OKRs consultants and researchers, this book provides a one-stop resource for organizations looking to quantify qualitative goals and ensure each team focuses their efforts to make measureable progress on their most important goals. You ll learn how OKRs came to be and how leading companies use them every day to help teams and employees stretch their thinking about what s possible, build their goal-setting muscles and achieve results that reflect their full potential. From the basic framework to a detailed dissection of best practices, this informative guide walks you through real-world implementations to help you get the most out of OKRs. OKRs help employees work together, focus effort, and drive the organization forward. Key results are used to define what it means to achieve broad, qualitative goals, and imperatives like do it better are transformed into clear, measureable markers. From the framework s inception in the 1980s to its popularity in today s hyper-competitive environment, OKRs make work more engaging and feature frequent feedback cycles that enable workers to see the progress they make at work each and every day. This book shows you everything you need to know to implement OKRs effectively. * Understand the basics of OKRs and their day-to-day use * Learn how to gain the executive support critical to a successful implementation * Maintain an effective program with key assessment tips * Tailor the OKRs framework to your organization s needs Objectives and Key Results is your key resource for designing, planning, implementing, and maintaining your OKRs program for sustainable company-wide success.